At the June 9 Commission meeting, highlights include approval of the fiscal year 2016-17 budget, adoption of three new and one extended strategic partnership and an update on Welcome Baby’s voluntary home visiting program. First 5 LA’s Commission unanimously approved a new, $161.5 million budget on June 9 for fiscal year 2016-17 that advances the organization’s emphasis on sustainable public financing, public policy and systems-level change at a time when tobacco tax revenues are declining. An overall decrease of $56.7 million (26 percent) reflects both a decline in tobacco tax revenues and expenditures. The FY 2016-17 budget also represents a strategic shift to focus on the strategies and investments prioritized in the 2015-2020 Strategic Plan.? This includes funding for the agency’s Best Start Communities effort, a voluntary home visiting program for new parents, and efforts to improve early care and education and health-related systems. An increase of $32 million (54 percent) to support some of the initiatives in the four priority outcome areas in the 2015-2020 Strategic Plan. These four outcome areas include Families; Communities; Early Care and Education (ECE) Systems; and Health and Mental Health & Substance Abuse Systems. A decrease of $89.8 million (69 percent) in resources for Legacy Initiatives. This reduction includes approximately $55.4 million in annual funding specifically for Los Angeles Universal Preschool (LAUP), shifting the focus from direct services—providing funding for preschool slots—to policy and systems change in the area of early care and education as directed by the Strategic Plan. Read a detailed budget breakdown here. Staff presented a Welcome Baby Implementation Update to the Board that featured the most recent enrollment statistics, outcome data from participation, and a look at future evaluations and policy and systems change efforts underway to educate legislators and stakeholders on the importance of home visiting. 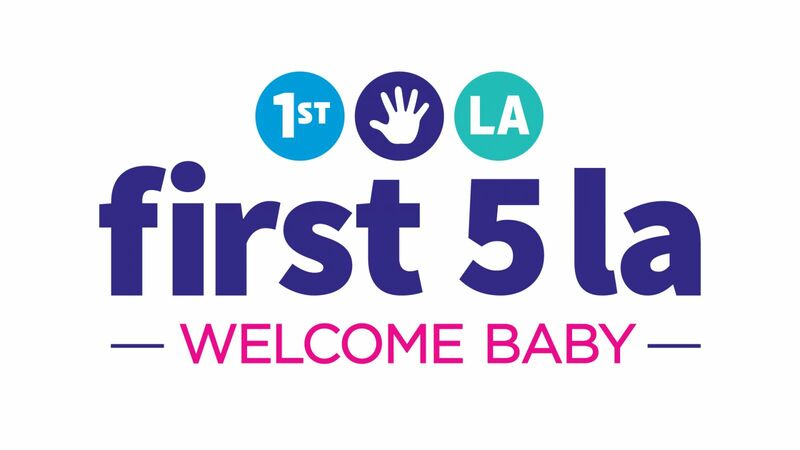 As the largest investment in First 5 LA’s Families Outcome priority area, Welcome Baby is a free, voluntary hospital and home-based intervention open to all pregnant and postpartum women who give birth at one of the participating hospitals. In addition to maternal and infant screenings, expectant and new mothers in the program are visited by a nurse or trained home visitor who provides information on positive parenting, child health and development, breastfeeding and links to any needed community services. If a family is identified as needing more intensive support, they are referred to a Select Home Visiting program funded by First 5 LA. Highlights of the presentation included a doubling of enrollment in Welcome Baby between fiscal years 2014-2015 and 2015-2016, strong participation (78 percent of clients) by the Latino population and a majority of clients providing some or exclusive breastfeeding. Additionally, three more evaluations of the program will be conducted in the future. Read the full presentation here. The presentation prompted both praise and discussion from the Board. Reception of up to $2,440,944 from First 5 California (F5CA) to receive funding beginning April 1, 2016 and ending June 30, 2020 to establish a Regional Coordination and Training and Technical Assistance Hub (T/TA Hub) in Los Angeles County to support ongoing work toward a uniform Quality Rating and Improvement System (QRIS) The work of the T/TA Hub will be supported through Data Systems and Planning Funds ($280,800) and Planning Information Support Funds ($16,000) from F5CA. A $475,000 partnership with Children Now to identify and implement a Kindergarten Readiness Assessment (KRA) in Los Angeles County that can be used as a platform to advocate for policy, fiscal, and systems change. A four year, $1.75 million strategic partnership with the Child Care Alliance of Los Angeles (fiscal agent for Partnerships for Education, Articulation and Coordination through Higher Education: PEACH) to enhance First 5 LA’s early care and education (ECE) quality improvement efforts by advocating for an ECE teaching credential. A strategic partnership with the Child Care Alliance of Los Angeles (CCALA) for an amount not to exceed $1.2 million as part of First 5 LA’s goal of improving the quality of early care and education settings through a Quality Rating and Improvement System (QRIS). Extension of a strategic partnership with Third Sector New England (fiscal agent for Opportunities Exchange) for up to $600,000 that enhances First 5 LA’s early care and education (ECE) quality improvement efforts by strengthening the capacity of ECE providers to work through a shared services approach. Read more details from the Commission Meeting agenda here.